The INDX 43 2.0b provides higher productivity and greater flexibility over the 37 2.0b model. A fully automatic medium range film processor designed for free standing or “through-wall” darkroom loading, incorporates a warm air, flat path dryer with an inbuilt internal air flow/exhaust to ensure efficient drying and optimal operating conditions. It provides a maximum feed width of 43cm/17in for sheet and roll film and is easily configured for table top operation or on an open stand. Colenta introduce a new concept in mobile Inspection workshop containers designed to provide a flexible and customised facility, for on-site inspection work, where required. Each container can be adapted for both analogue and digital inspection requirements with the equipment and services to meet precise customer requirements. The mobility and safety features within the design ensure ease of movement to a working location anywhere in the world. All container workshops are, factory tested, fully equipped with the necessary services and facilities to provide safe and efficient working conditions to enable inspection staff to to get the job done effectively and at the highest level. Transport System Type "INDX 43/5MW"
The COLENTA intermediate rinse bath (prewash) system with squeegee rollers between fixer bath and main wash tank, offers a double wash or cascade wash facility, whereby the prewash takes the main part of the silver containing fixer carryover, suitable for separate collection or connection to an inline treatment unit – See our Metafix range of electrolytic silver recovery units. Additionally the intermediate rinse baths system gives consistently clean film/paper with minimal carryover of chemistry into the next solution, and savings in the replenishment costs and daily cleaning time. 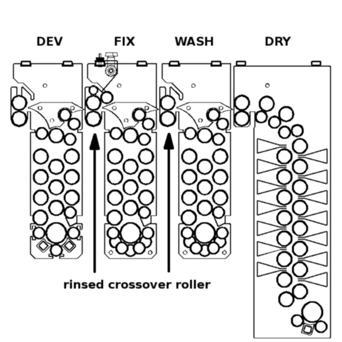 Crossover rollers located above liquid level are designed for easy removal and cleaning. For COLENTA’s INDX-processors, a delayed wash water supply (especially an issue when programmed for extended processing cycles) is a standard feature. The microprocessor controller monitors the positions of the films while travelling through the processor and supplies water to the wash section when a film enters this section. As an additional option, the amount of washwater supplied can be linked to the size (m2) of film entering the wash section – an attractive water saving feature. The COLENTA roller transport system does not use spring tensioned opposed rollers or metal guides, which can cause pressure marks and scratches on the emulsion. Any length of roll film can be processed. All transport rollers are below solution level, eliminating crystallization and dirt build-up on the roller surface that could cause damage to the emulsion or dirt related quality problems. The submerged rollers are designed to balance in solution consequently reducing pressure and wear on bearings - virtually eliminating maintenance costs and extending the life of the racks. The COLENTA transport racks are individually identified and fitted with maintenance free inline precision gearing systems to give trouble free operation.As an additional option, the amount of washwater supplied can be linked to the size (m2) of film entering the wash section – an attractive water saving feature. COLENTA’s programmable multi channel memory microprocessor controller, allows the operator to preset exact processing data parameters. All indications are given on the digital display on the CPU board of the microprocessor, where all error indications are also shown. For error indications and film feed release an additional audible signal is available. Functions like automatic standby, water saver, antioxidation and anticrystallization cycle, automatic start/stop function, are state of the art for COLENTA processing equipment. We replenish exactly according to the amount of square cm/inches of film surface fed into the processor - we use pulsed infrared sensors for our replenishment system, instead of mechanical replenishment switches. COLENTA’s slim roller transport rack design results in low volume tank processors - already a big move forward to forthcoming new processing technologies - LTTV (Low Thin Tank Volume) technology. Also due to the slim COLENTA rack design, a small surface of chemistry is exposed to the air, reducing air oxidation. Both advantages - less air oxidation and easy, quick complete turnover of the whole content of the low volume COLENTA processor tanks by normal (or even reduced) replenishment rates lead to more consistent high quality processing results. 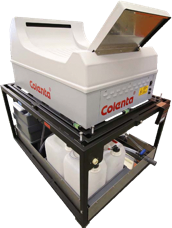 To meet the increasing needs for an all in one compact and portable film processing system, Colenta have produced the INDX 37 NDT Mobile which provides a self contained film processing facility that can be installed inside a truck body or container and moved efficiently from location to location as required. The system is configured with all that is required for the automatic processing of industrial x-ray film sizes up to 35cm in width inside a vehicle and with a series of options to meet specific needs that a customer may have based on their typical working sites and conditions. The attached information details the INDX 37 NDT Mobile design features and specifications and provides an overview on the optional accessories and the benefits they provide in extreme operating conditions. Colenta provide a full range of processor options and accessories for processing NDT films. Their robust design, build quality and low maintenance requirements make them to an ideal choice for use in this very specialized market. Staggered “minimum contact” roller system ensures safe, clean and dry x-ray film production. Low power requirements, low operating costs.